The judge said said that when the Stampede Parade pace car passed their location, Pawlowski and his Street Church followers left the side of the road, entered the parade route, and began to walk behind the pace car as though they were leading the parade. 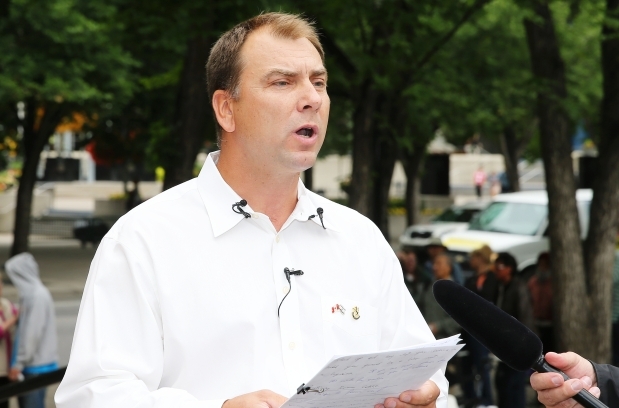 Street Church preacher Artur Pawlowski was fined Monday for breaking a city bylaw by trying to crash the 2012 Calgary Stampede parade with a group of his parishioners. 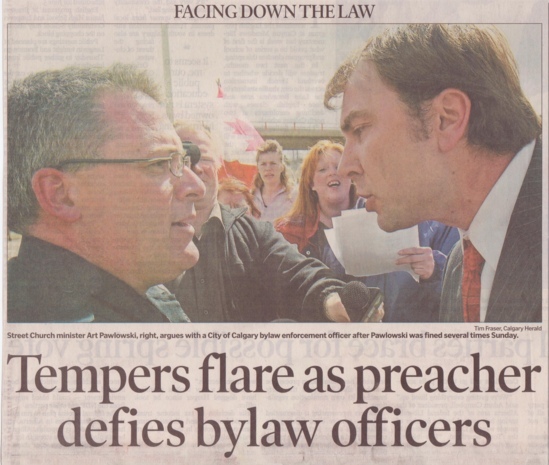 Provincial court Judge Mark Tyndale said in sentencing Pawlowski that he did not feel it was necessary to go beyond the $200 minimum amount prescribed by the City of Calgary when it drafted the bylaw, even though the Stampede felt the preacher had “hijacked” the 2012 parade. Tyndale said he did not believe that Pawlowski or his fellow parishioners committed the offence for any personal gain, but just to get his message across to the public. “He agreed to move on after he was confronted,” said Tyndale. “The city police cyclists rode behind him to separate them optically from the next float, the Calgary Stampede Marching Band. Police were there to keep the peace and deal with any unforeseen incidents arising. City prosecutor Ola Malik had sought a minimum fine of $1,000 up to $2,000. Defence lawyer Michael Bates said it did not warrant more than the specified fine. Tyndale had found Pawlowski and the three others guilty in June of breaching the Calgary Municipal Traffic Bylaw, which carries a maximum fine of $10,000. The other three accused were also previously handed $200 fines and the judge felt they should not be treated differently. In his written decision released on Friday, provincial court Judge Mark Tyndale upheld and said Pawlowski’s rights to freedom of expression may have been infringed to an extent, but Pawlowski contravened the same rights of both the Stampede and spectators at the July 6, 2012 downtown parade to kick off the Stampede. “No right enjoyed by Canadians, including a fundamental right such as freedom of expression, is limitless,” Tyndale said at the time in convicting Pawlowski, Jacek Mrozek, Marzena Podpryga and David Pawlowski of the same infraction. To avoid the disruption that Pawlowski’s protestations could cause, the Stampede offered them the opportunity to join at the back of the parade. “Pawlowski’s only response was that he would not be treated like a dog,” Tyndale said. Tyndale said as soon as the parade began and the pace car passed their location, Pawlowski and his Street Church followers left the side of the road, entered the parade route, and began to walk behind the pace car as though they were leading the parade. “The Calgary Stampede felt that Mr. Pawlowski and his group had ‘hijacked’ the Centenary Calgary Stampede Parade,,” the judge asserted. The group proceeded to march in front of the parade for most of its route. Bates had argued there was no provision in the Criminal Code that prohibits the peaceable, albeit unwanted, joining in with a parade, as long as no other criminal conduct is exhibited. The Calgary Police Service determined Pawlowski was not committing any criminal offences that day, he said. “Stampede organizers have the right to carry out parades because they are granted permission. This acts as a form of expression by the Stampede, and Street Church interfered with those rights,” Malik said. Tyndale noted Pawlowski’s determination to be a part of the parade had been a concern for several years. He has also clashed with the city over sermons via loudspeakers in inner city parks for years. Malik said Pawlowski, who has been banned from participating in the parade, has not caused any disruptions the past two years. ← Another victory for Artur Pawlowski and Street Church! June 18, 2014 Artur Pawlowski Comments Off on Is the March for Jesus a walk for hate?